Ooh, I loved reading everyone's comments from yesterday. I've got a giant list of spooky books for future reads. Many of my readers claimed to be too faint of heart for scary literature. I myself am a world class chicken, deathly afraid of spiders, monsters, and bad guys. I don't watch any of the slash em' up thrillers that play in today's movie theaters. I will watch some Hitchcock, and the rare PG scary movie. Now, that being said, I love a suspenseful and spooky read; not a murderous blood and guts dime store novel, but a classic book with macabre undertones. I love having the shivers when I know that I'm safe. And my love extends to frightening poetry as well as novels. Which brings me to today's Cookie Bookie read: "The Raven" by Edgar Allen Poe. This summer, I read a biography on Poe. He was quite an odd duck, just as you might have suspected. He was passionate, morose, and fickle. Once he composed a beautiful love poem for his young wife (a cousin he married when she was all of 13 years old), and over the course of his lifetime, presented it to several different women that he admired. Of course, he was saavy enough to change the name, the lady-killer. But when Poe was writing "The Raven," he knew he was on to something. The poem was years in the writing and editing, but through it all he sensed that his magnum opus would cast a public light on his eerie genius. 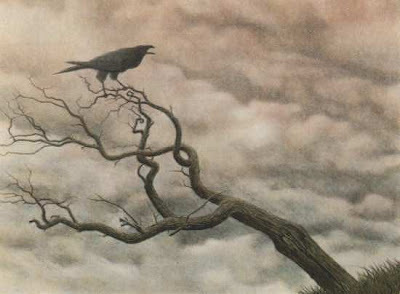 The poem recounts the midnight visit of a talking raven to a downcast lover, mourning the loss of his beloved Lenore. The lover, provoked by the raven's constant reminder of "Nevermore," sinks to madness by the poem's end. 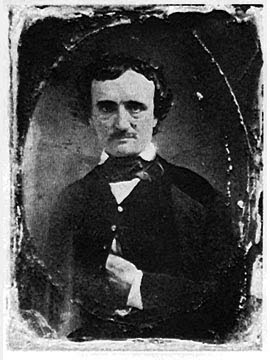 This is Poe at his finest, in superior command of the language, and embracing all of the mysterious themes that earned his reputation for being one of the most disturbing and talented poets of the Romantic era. Here's the first stanza for you to nibble on. Every year I vow to memorize "The Raven." I'm lucky if I know the first stanza, but every October, I keep trying. And now, since we are so civilized as to be reading poetry, I thought I could share a sweet that is equally as elegant. Today's cookie is a buttery maple shortbread studded with bits of pecans. It's just perfect for dunking in a cup of apple tea, by the fire, with a blanket over your knees and a book of poetry on your lap. Get cozy and get reading! Preheat oven to 350. In a large bowl, cream butter and brown sugar until fluffy. Stir in maple extract. Add flour and salt to form soft dough. Stir in pecans. Roll out dough on a sheet of waxed paper. Cut cookies into 2 inch circles and place on cookie sheet. Brush tops of cookie lightly with egg and place pecans in the center. Bake at 350 for 10 minutes. Poe was just given a decent and honorable burial. Did you hear/read about that? It happened just last week. "Once upon a midnight dreary." Did you know that is also a line in a song? I always love when musicians and songwriters borrow or give literary references. Blues Traveler uses his line as the first line in one of their songs. Thanks for making us think about The Raven today. I will think about it today and remember it for ever more. Uhhhhhhh.......that was me, not Mal, just in case you were wondering. I don't have any idea why my comments are showing up as Mal, but I'm pretty certain I won't be able to fix it. I've been following your blog for months and love it. You're so creative and frankly I don't see how you can find time for everything that you do. Props to you! This recipe looks delicious, but can you tell me at what temperature you bake the cookies? I fixed the recipe. Thanks so much for your kind words. I just love anykind of shortbread! But this one with the half of the peacan there, calling my name, is really right up my alley! So perfect to read with those strories! how is it wednesday and i just made it over for cookie bookie week? sheesh! i guess i've been busy. shortbread are some of my favorite cookies--i can't wait to try these. i've got the first two stanzas memorized, but the rest of "the raven"? nevermore! These cookies were delicious. I'm a succor for shortbread,too. I saved one for Dad and forgot to tell him....I must confess that he never received his cookie. It's not my fault--they were too delicious :). Okay, at the risk of losing all credibility, I want to recommend the Simpson's (yes, THOSE Simpsons, the show every sixth grader except me watched, thanks MOM) version of The Raven. It's pretty well done. As if some salesman were a-mucking, mucking about my kitchen door. AB: 'Tis some salesman. Only this, nothing more. And yet presently the noise repeated. So I hollered, no longer seated. AB: Beat it, pesky husker, mucking about my kitchen door. At my business I'm now working, so my chain you'd best stop jerking. Then throwing wide the kitchen door, I found there a chicken and nothing more. Mount the folk-art bust of Julia Child there upon my kitchen floor. Just listened to the Simpson's raven on Youtube. I should have posted a link. That's hilarious! I love the last line. I'm going to try to find it on youtube! following the paleo diet this is a great advocate of fresh foods.